“Bear markets make people a lot of money, they just don’t know it at the time.” For some of us looking at our crypto currency portfolios and trading accounts right now, this quote, by Shelby Davis, couldn’t seem further from the truth. But, the truth is, investing, and even trading, has never been about “right now.” There is an ebb and flow nature of all things in life, markets are far from excluded. In 2017 we saw the breath taking rise of Bitcoin that took the entire world by storm; people sold their houses, took out loans, and maxed out credit cards for the chance to ride the most bullish market anyone has ever seen. 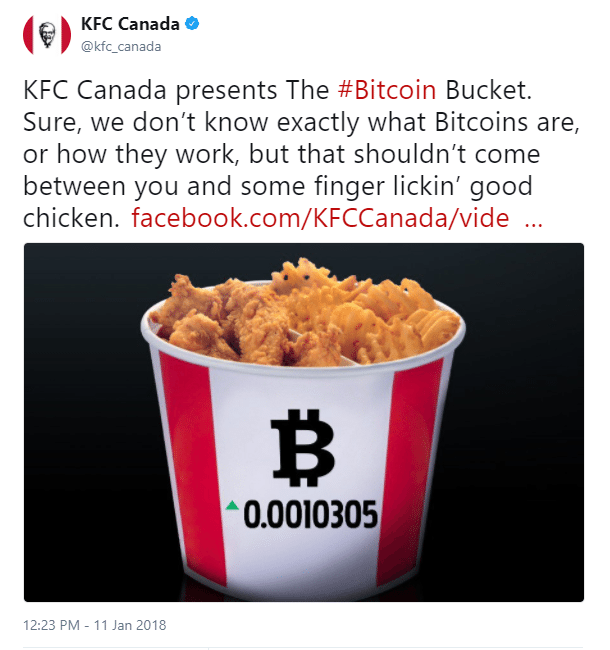 Hell, KFC even used the craze to increase sales on fried chicken. Now rewind the clock to a mere four years before this all took place. From November 2013 to January 2015, Bitcoin crashed 86%, all the way from $1163 to $152. To many, Bitcoin was dead. But to some, the few, who believed in Bitcoin, or knew how market dynamics worked, this was seen as an opportunity. For price to drop as low as $152 there had to be someone there to sell their Bitcoin at that price and someone there also buying it. The person who bought Bitcoin at $152 is still up 4,432% at the time of this writing, and at one point was up 13,000% when Bitcoin was at its all time high of $20,000. If you were to tell the people buying, or even still holding their Bitcoin, when the price was $152, that in less than two years they could sell their Bitcoin for $20,000 each, they probably would not believe you. We cannot put ourselves directly in their, likely now high end, shoes, but we can prepare ourselves to be set up in a similar situation. A situation only possible in the event of a downtrend that causes all of the get-rich-quick hands in the market to lose their money fast, a downtrend that flushes out all of the Ponzi schemes on the way down, a downtrend that exposes the exchanges not suited to take on the next major asset class of this world, a downtrend that shines the light on the scams, building a better infrastructure with legislation ready to handle the next meteoric rise of sound money. It is easy to point fingers as to why the crypto market as a whole is dropping, a few culprits being China banning crypto for the 17th time, the SEC hearing, Bitconnect stopping loans (surprise). At the end of the day, though, what it all boils down to is human emotion. Humans are tribal creatures at the core, our first instinct is to act similar to each other in order to be accepted and thus increase our chances of survival. This simple biological function affects markets in a huge way. People see a holder of the asset, with a larger share than most, sell and cause the price to rapidly drop. They then do the same, attempting to sell before price falls further, thus causing the price to go even lower, until it becomes a domino effect and a race for people to sell at a profit or cut their losses. While this is happening, the sentiment and emotion in the air, the thing that is the root of all market movements, is also shifting. This feeling of fear and panic overtakes most participants. The asset stands very little chance of recovering, as every move up is seen as an opportunity to sell at a good price, which continuously knocks the price down. This situation occurs until price reaches a low which is too enticing of a discount for buyers to turn down, causing price to launch upwards and form a reversal pattern. The sentiment in the air begins to shift and mix between fear and now hope, resulting in a sideways movement called accumulation. 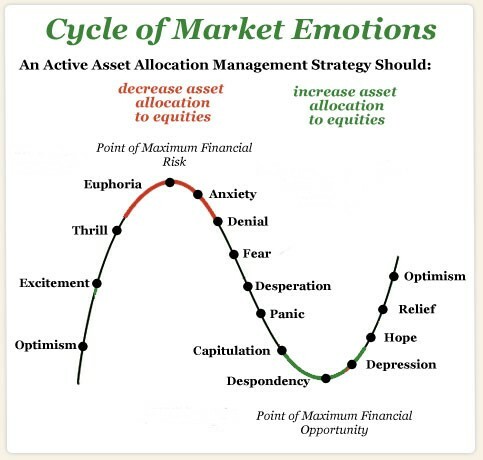 Accumulation is a gift and a cornerstone part of the cycle all markets experience, and should be expected in our current situation. This is when you buy the present day version of a $152 Bitcoin, when you seize the moment and act on the financial opportunity of your lifetime. Poloniex, one of the older, and now less used, crypto currency exchanges, is one of the few in the ecosystem that allows traders to margin trade coins other than Bitcoin. In the current state of crypto, many altcoins are hyper inflated and have reached parabolic highs followed by blow off top events. This is usually followed by an equal reaction to the downside, during which traders can take advantage of this pattern, and even borrow 2.5x your holdings in order to bet on the currency’s temporary downfall. 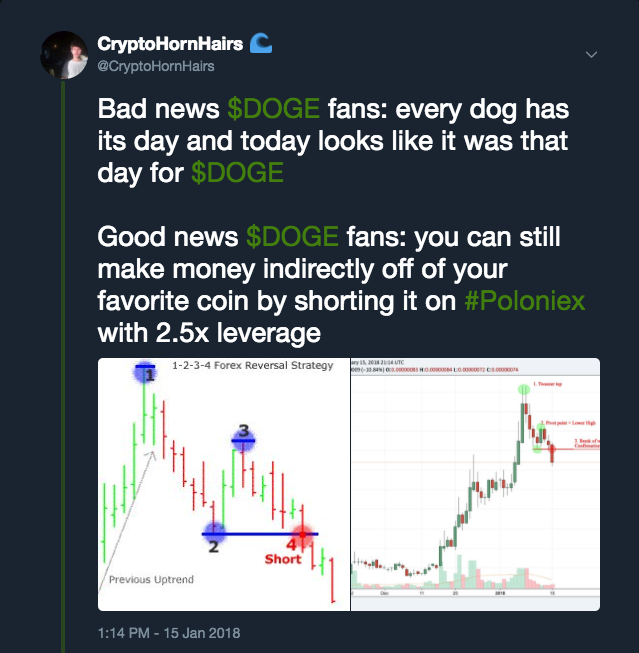 If you follow me on Twitter, you have seen me discuss this before, in the most recent example, I spoke about DogeCoin. There are several guides on how to margin trade on Poloniex online, including YouTube videos. I recommend starting with very low position sizes to get the hang of the interface and to get used to how stop losses, collateral, etc, all work for that platform. Some people see shorting Bitcoin in a sort of taboo light. Wishing for the thing they support to temporarily fall seems counterintuitive . To me, shorting Bitcoin is solely an opportunity to acquire more Bitcoin. This is only possible if you can look at the market objectively and realize that for every action in the market there is a reaction. I am massively bullish on crypto currencies and Bitcoin in the long term, but realize there will be moments this ship has to refuel and cool down, these are the moments to gain more of this precious commodity. Shorting Bitcoin can be done in multiple places, two of which are Kraken.com and Bitmex.com. Kraken’s user experience is notoriously atrocious but they are one of the few platforms you can short Bitcoin and enjoy profits straight into fiat. Bitmex on the other hand is a great way to short Bitcoin using a fantastic interface that pays you out directly in more Bitcoin. Margin trading is inherently risky, as all trading is, but if you have a reasonable head on your shoulders and an ounce of self control you can minimize said risk. Even shorting using 1x leverage (shorting the same amount you hold in your trading stack), just as a hedge, is a way to mitigate losses during downward movements. It is crucial that a trader knows how to navigate both directions in a market, as only being able to profit one way is a huge handicap, not only for your opportunity cost but your mental bias. Adding this to your trading tool belt minimizes the pull for a trader to make the mistake of only seeing what he wants to see when viewing a chart, since now either direction leads to potential profits. 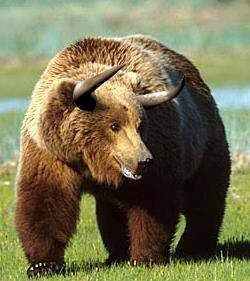 In a bear market, a trader should revere the saying “sell the tip” the same way they used to with “buy the dip.” That rare moment in a bull market when price dips low to support is seen as a golden opportunity to make money. The same can be said during the occurrences when price bounces upwards off of a support zone during a bear market. These bounces are chances for you to buy low and sell high, even while price is trending downward. Of course, “the trend is your friend,” and counter trading the direction of the macro movement always poses a risk, but if you would rather stay away from margin trading this is an option. 1broker.com is a website that allows you to trade legacy markets, with leverage, using Bitcoin as capital. 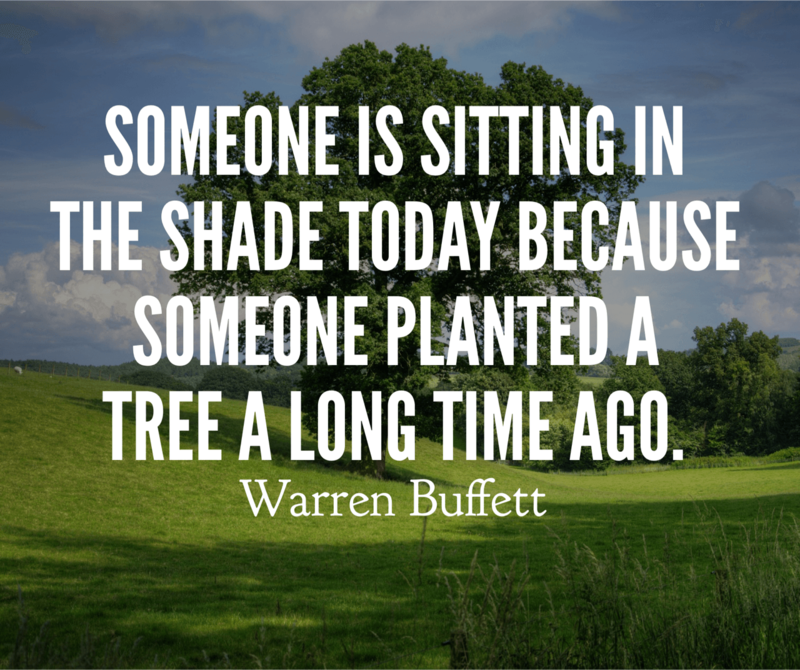 That means your profits and your losses are also distributed in Bitcoin. One can trade everything from Silver to Twitter stock using Bitcoin on 1broker, which gives a trader an opportunity to expand their horizon and have a better view of the financial ecosystem as a whole. If you do not feel comfortable trading these markets, 1broker has a very interesting feature called social trading. Social trading allows you to follow other traders on the platform, copying every trade they execute automatically, with an amount of Bitcoin you specify per trade. Every trade is transparent and there is even a leaderboard, enabling you to scout out talent and put someone else behind the steering wheel during times of bear.